Ferries to Koh Phi Phi are a gratifying cruise amongst some of the finest scenery in south east Asia. The views of the Phang Nga Bay islands on both the Krabi and Phuket side of Koh Yao are enough to make you understand this region is more than just Koh Phi Phi, a place you can return to time and again. In the dry heat of the high season months of November to April 30th, the distant Phang Nga bay islands often come over as a purple coloured landscape set on a deep blue sea. The rush of the water past the boat, the splash of the waves on the bow, offer a mesmerizing sight and something that enchants. The main ferries to Koh Phi Phi leave from Krabi town pier, Ao Nang beach, Rasada Pier Phuket and Saladin Koh Lanta ensuring every which way you want to island hop, you can move around with out any tedious taxi or bus journeys. All these main ferries to Koh Phi Phi takes about 1 hour 15 minutes to 1 hour 30 minutes as Koh Phi Phi is equidistant between all piers. As you leave the respective harbours you quickly gain sight of the Koh Phi Phi Don and Koh Phi Phi Ley cliffs towering above the horizon. It is now just a case of watching them grow. If you take the morning ferry from Phuket there is something ominous about these cliffs in the shade and yet the afternoon ferry sees these same walls in the striking sun light, and makes them even more imposing. Sea Angel Phuket 08.30 ferry in the morning. Koh Phi Phi Don cliffs in the distance. The ferries to Koh Phi Phi schedule can be found on this link but suffice to say Phuket and Krabi Town have a morning and afternoon service and the Ao Nang and Koh Lanta leave their ports in the morning for a day trip to Koh Phi Phi and return in the afternoon. The ferries are a lot better than they used to be and are now pretty much on time all the time. Having said this, if you get caught in traffic, don’t give up as there are still enough occasions when the ferry is late in departing. The 5 star and luxury resorts of Koh Phi Phi are in the north on Laem Tong and Loh Bagao beaches. The Zeavola Phi Phi Resort, Holiday Inn Phi Phi Island and Phi Phi Island Village Resort And Spa all require further transport to the reception as there are no roads from the main ferry pier to the north. If you are arriving by main ferry the resort will pick you up from the Koh Phi Phi Pier. They do this by holding up a sign with the hotel name on it and often with your name on it. It's just like a taxi pick up at an airport. Some prefer to organize their own private speedboat and this is quite common when they are coming from Phuket International Airport and Krabi International Airport. 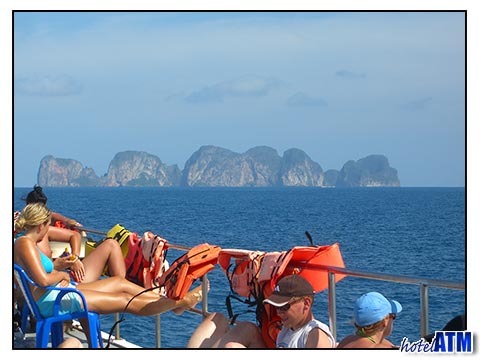 To book this service you can click here; Koh Phi Phi speedboat transfer.